Booklet No. 3. Price 6d. A "DISTRICT" in the use of the term by the Melanesian Church means the area over which a priest has charge. It may be an island, or possibly more than one. It may be simply a part of one of the larger islands. Some districts are very isolated and sparsely populated and the priest sees no other missionary perhaps for twelve months at a time. 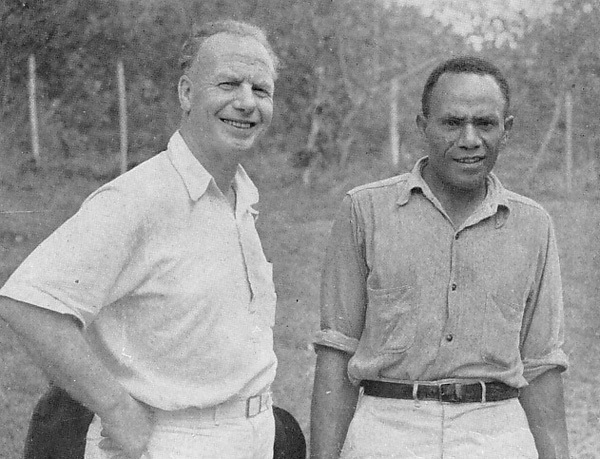 The "missionary" stress in Melanesia is rapidly giving way to that of the "Church". There still are heathen and evangelization goes on, but Christians out-number the heathen and need the care of the shepherds. Within a district there will be a number of villages, each with a Church and Teacher. Daily services will be held, that is, morning and evening prayers and such others as can be taken by a teacher in the absence of a priest. Ideally there should be a village school too, but in many places the schools were discontinued during the war and, for various reasons, have not been opened again. If there is a school the teacher will have classes daily. In any case he will have classes of instruction for the Sacraments. The District priest will visit the villages regularly, moving from point to point by boat, canoe, or on foot, along the coasts or up into the hill country--the bush. He will administer the Sacraments, exercise discipline, examine the schools, encourage the teachers and visit the sick. He will hear all the village scandals, act as peace-maker between husbands and wives and endeavour to reconcile quarrelsome neighbours. In short, he will [3/4] try to apply Christianity and its principles to all the details of village life. At home he has a dwelling and usually while he is there a stream of messengers will be arriving from the district asking for guidance and help of one kind or another. Some matters will be of the greatest importance, others of the utmost triviality. He often needs to exercise the greatest patience. In the villages he probably has a hut, or small house, maintained by the villagers for himself and his crew--he will have men with him to row the boat or paddle the canoe. These will be a minimum number as each village supplies a man or two to help the priest on his way to the next halt. Having arrived and settled in he will at once be expected to hear all the "news", births, deaths, village gossip, enterprises, grievances, etc., etc. After a "cleanup" and perhaps some food he will conduct Evensong followed by a Preparation Service for the next morning's Communion. This over-night preparation is the custom throughout Melanesia and a Form is Prayer Book. There will be Confessions to hear, penitents to restore, and, if the occasion demands, Catechumens and Confirmation candidates to test. In the Christian areas adult baptisms are now the exception. In the morning there will be the Celebration, and possibly marriages and baptisms. After a meal he will probably move off to the next village. The stay in any village depends upon the amount of work there is to be done. Usually the priest keeps moving, as he has a big distance to cover and many villages to care for. For many years this work was done by white clergy. Now there are no white clergy doing district work. 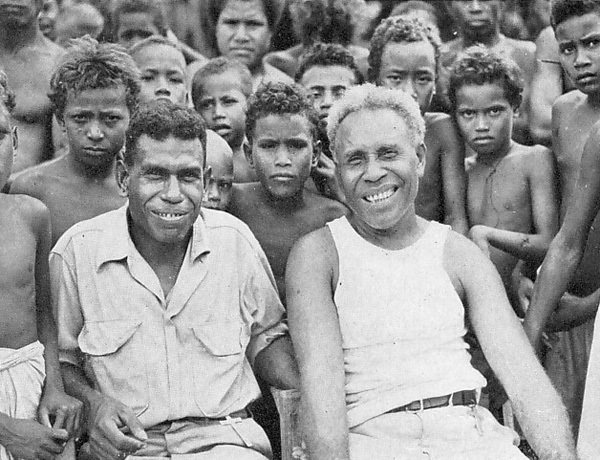 The Melanesian clergy number about eighty. More than fifty priests and the remainder deacons. Their work is unceasing, a continual round of visits, in all weathers, [4/5] cheering, scolding and cleaning up, and feeling quite often that he needs all this himself. Some such men are working in very isolated areas and their life and interests are, and can only be, the "common round". With the growth of "modern" problems among the people generally, the native priest must be prepared to discuss matters of "Government", work, wages, and allied affairs. With the recognition by the Government of the possibility of "divorce", the priest must be armed with knowledge and patience in order to prevent the break-up of marriages. "As thy days so shall thy strength be." 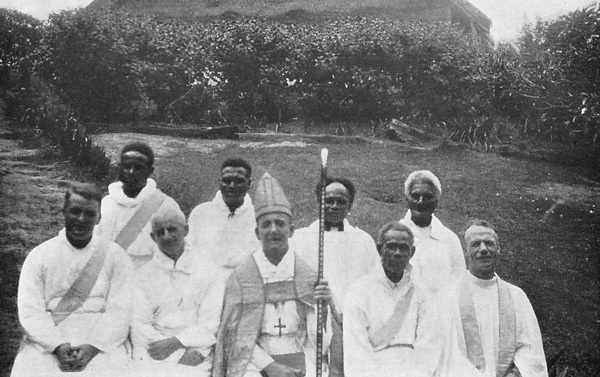 The Melanesian Clergy have risen nobly to the demands made upon them and, under God, have proved themselves worthy under-shepherds of Christ's flock. Discipline. Church law is a real factor in the life of the native Christian, its discipline is accepted by him. The missionary first and now the native clergy have to apply this. There may be confusion sometimes between the boundaries of the Church law and the State law, "law belong Government" as they say, though it is not nowadays quite so crude as in the heathen island where a request was once made to send a "man-o-war" to make some naughty girls attend school! Long before the days of established Government in the islands there was only native law and Church law. A Christian, say, who stole could only be punished in native "fashion", or by being disciplined by the Church until he repented and made restitution. During the time of discipline he was in public disgrace and he did not like that. Even if the Church was not of great concern to him he did not like exclusion from it. The usual reaction to "You must not" is "I want to". For small faults he would be forbidden to come to Church for daily prayers for a short period. If a communicant he might be forbidden to approach the Altar for a time. For a [5/6] grievious fault the period of suspension would be longer. If a teacher or a person in some important office he would show his sincerity as an ordinary member of the congregation. When restored he would, in most cases, continue his work in a place other than that in which he caused scandal. He would, in all cases, if possible, make restitution. Conduct during the period of suspension is the test of penitence. Restoration is public, before the whole congregation, and, if possible, in the place where the wrong was done. Cases of obstinate wilful sin are reserved for the Bishop, and the extreme major excommunication might follow. This has happened in very rare instances. These men have passed through a Central school and have shown some fitness for their task. They are all volunteers. The Teachers. They are the backbone of the Church, in Melanesia. Like teacher, like people is almost invariably the case. They are the pastors and schoolmasters of their villages. Often, they are on their home ground and living among their own relatives and in a position that can be very difficult. It may happen that the teacher is called upon to adjudicate in disputes and troubles between members of his own family and other people and it will need a lot of grace for him to take the right line. There are never enough of these men. Some, of course, are unsatisfactory, but, as a class, they are faithful, persevering, and courageous. Many of them after a time as teachers are called, after further training, to the Diaconate. The District priest must know his teachers. He must keep them in their places, literally, because they are likely--some of them--to "gad about ". It will be his business to move them, either for promotion or degrading. Occasionally there is the teacher who has fallen into grievious sin and has caused scandal. A sad problem and one that must be investigated thoroughly. It does happen that a teacher is accused falsely by someone with a grudge against him. Sometimes, although these cases have become much less in number, he is accused in good faith but quite wrongly. The truth is often hard to get at. In the Melanesian mind suspicion and proof are often confused, and, "I think so" or "They say" taken as conclusive evidence. There is sometimes the square peg in the round hole and liking it. He ought to be moved but wants to stay. There is the old teacher who after years of faithful work is not at all willing to relinquish it. A teacher dies and there is no one to fill the gap. The District priest has much to occupy his mind in settling all these matters. The village schools. These are of the highest importance as upon them depends the future of the children. 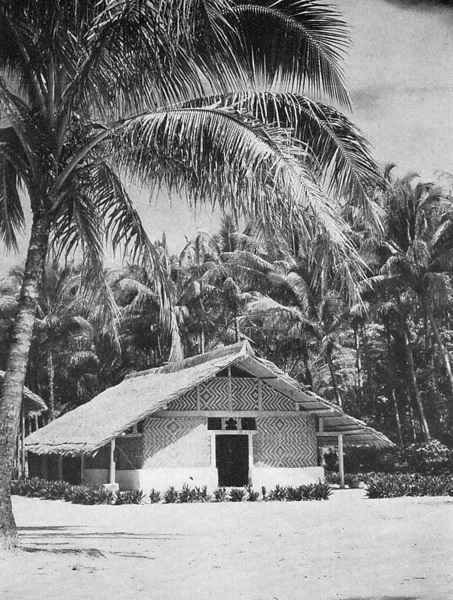 The buildings are simple native structures and the equipment of the simplest. A few seats of bush timber and tables too, but lucky people having obtained empty cases contrive to get a table-top which is more or less flat. A register is kept. A.B.C. sheets, chalk and blackboard, simple primers, slates and pencils. The teacher has a limited syllabus to cover. This is intended to test the ability of the scholars to proceed to the "District" school which is a school not too far from the boys' homes and which serves an area comprising several villages. These schools, village and district, are built and maintained by the people. They relieve the pressure on the ship of taking numbers of boys to distant places for school. The Mission is saved much expense by the earlier steps being taken at home and not in Mission schools where board and lodging must be provided. One result of the invasion was the wiping out of many village [7/8] schools. As more young teachers become available it is expected that these schools will be re-opened. The work of the Archdeacon or other "overseeing" priest. Where possible, which means when staff allows, a white priest of some experience is given the responsibility of caring for the native clergy. Possibly he combines this with the care of the district and village schools. Such a priest has a pied-à-terre at one of the headquarter stations, and has a launch at his disposal to enable him to cover the area adequately. Like the native clergy he will be constantly on the move, but of course, covering a good deal more territory than they. It is a work requiring the utmost delicacy of perception, great tact, and the ability to lead, encourage, inspire and enthuse those for whom he is responsible. Matters which are "too great" or puzzling to the native clergyman will be reserved for him to settle. A discerning mind and great patience is needed in this difficult task. Upon such men is truly laid the care of the Churches.